This chapter studies colonial money, beginning from the time of Columbus and his voyage to the New World. Wampum, pillar dollars, Spanish reales, and more, all placed in context of American history, up to and including the causes leading to the American Revolution. The "Coins & History Chapters" button at upper right opens up other units in our US Coins & History section. The links directly below are sub headings in the "Colonial Times" chapter. Very early in the morning on October 12, 1492, the lookout aboard the Pinta, one of three ships commanded by Christopher Columbus, spotted land in the distance. After 10 weeks of sailing into the unknown, Columbus had discovered a New World. This oil painting by John Vanderlyn was placed in the US Capitol rotunda in 1847. 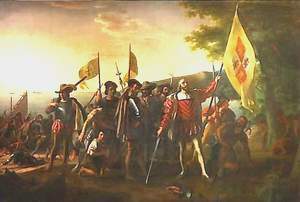 Columbus raises the royal banner to claim the land for Spain. His hat is on the ground to honor the sacredness of the event. Some of the crew are equally moved, while others sift through sand searching for gold. Image courtesy of The Architect of the Capitol. Later that same day, Columbus and his crew set foot upon the island he named San Salvador, thought by historians to be an island somewhere in the modern day Bahamas, and laid claim to the finding on behalf of his financial sponsors, King Ferdinand and Queen Isabella of Spain. Actually, Columbus was in search of an all-water route to east Asia, theorizing that the world was round and that a faster, more direct path to the riches of the Spice Islands could be found by sailing west from Spain. He was correct, of course, about the roundness of the earth, but did not realize that a couple of continents and two vast oceans lay between Europe and Asia. Columbus journeyed three more times to the New World in his futile attempt to reach Asia. He died in 1506, believing himself to be a miserable failure, not realizing that, given time, his discovery would have more importance to civilization than all the Asian treasures he sought combined. This 1513 map by Martin Waldseemüller's shows for the first time in an atlas format the newly discovered continents of North and South America connected by a coastline. The Florida panhandle and Cuba are clearly identifiable. Image courtesy of Library of Congress. 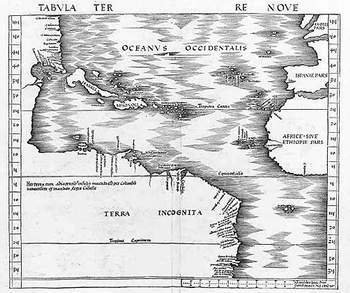 Given a head start by Columbus, Spain quickly dispatched other explorers to the New World (although the two unfamiliar continents were collectively named after an Italian, Amerigo Vespucci), laying claim to enormous expanses in both North and South America. Capitalizing on trade and plunder stolen from its American conquests, Spain became the most feared empire in the world by the 1580's. Judging by the number of its possessions, it would have been reasonable at one time to conclude that most of the New World would eventually be flying under the Spanish banner. In 1588, King Philip II sent a great naval force, the Spanish Armada, to England for the purpose of pounding the English into submission, which by then had become a serious nemesis at sea. Badly outnumbered, the English resorted to excellent strategy and trickery to inflict a disastrous defeat upon the would-be invaders, marking the turning point in Spain's world fortunes. While it remained a powerful nation for many years to come, Spain's diminished influence opened the door for England to establish permanent settlements along the eastern seaboard of North America. In 1606, a group of English businessmen, seeking a chance for profits, requested a charter, or authoritative permit, from King James I, in order to start up an outpost in a far away place called Virginia. The request was granted, and included a promise that all who took up residence in English colonies would retain their rights and privileges as Englishmen, and as such, be entitled to representation in Parliament. As we shall see, this promise became a bone of contention in later years. 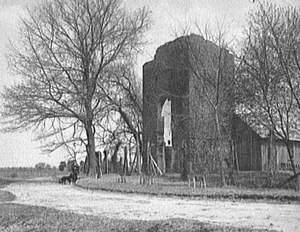 This photo, taken in the 1890's, shows a 1639 Jamestown church tower. The tower was one of the last remnants of the first permanent settlement in colonial America. Image courtesy of Library of Congress. The new Virginia settlement, named Jamestown, was founded in the spring of 1607. The colonists struggled for several years, being nearly wiped out by poor planning and disease. Thanks largely to the leadership of John Smith and the discovery of tobacco, the colony survived. Soon, other English colonies took hold, such as in Plymouth (Massachusetts) by the Pilgrims. As time went on, an increasing number of Europeans recognized the New World as an opportunity: a huge, fertile wilderness where the ambitious could achieve economic success. Others saw hope in America as an escape from religious and political persecution. By 1732, when the Georgia colony was started, English settlers had established thirteen colonies in America. At one time on the verge of failure, colonization was now pictured as a resounding triumph. Still, no one could have predicted the greatness that lie ahead. Minted in Mexico in 1746, this coin is an example of the famous "pillar dollars" (or pieces of eight) that were used so extensively during colonial and post-colonial periods in American history. Image courtesy of EarlyAmerican.com. The story of American money began more than three centuries ago. The early settlers of New England relied heavily upon foreign coins for conducting their day to day business affairs. At any given time, coins from Europe, Mexico, South America, and elsewhere could be found in circulation. Of special importance were the coins that migrated to the colonies from Spanish possessions in the New World. Included in these were the Spanish milled dollar and the doubloons (worth about $16). 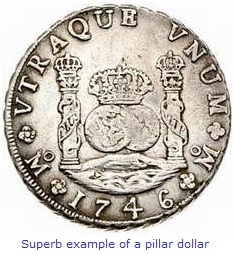 The Spanish milled dollar, also called the "piece of eight" or the "pillar dollar" (because of the pillars flanking the globes) was the equivalent of eight Spanish reales. One real equaled 12.5 cents and was known as a "bit". Thus a quarter came to be known as "two bits", an expression still used today. In December 2003, perhaps the foremost authoritative reference ever on Spanish mints in the New World, Cobs Pieces of Eight and Treasure Coins: The Early Spanish American Mints and Their Coinages, 1536-1773, was published. Containing over 2000 photos, this work will provide historical background essential to understanding 250 years of Spanish history in the Americas. In the absence of circulating coinage, wampum was used in the northeastern colonies as substitute money, giving rise to the current slang "shelling out". 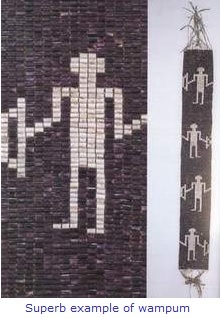 In 1611, the Huron people presented the wampum belt shown above to Samuel de Champlain, the governor of the French colony of Quebec. Image courtesy of Inquiry Unlimited. The Spanish milled dollar and its fractional parts were the principal coins of the American colonists, and served as the model for our silver dollar and its sub-divisions in later years. For the most part, however, much larger quantities of coins were needed. Because of the scarcity of coins, especially in the more remote areas, the colonists sometimes used other mediums of exchange, such as bullets, tobacco, animal skins, and very importantly, strung-together mussel shells called wampum. Wampum was made from hard-shelled clams, usually the Northern Quahog (purple) and Atlantic Whelk (white), broken up into small beads, polished, drilled through lengthwise, and then strung together. Native Americans were the first makers of wampum. The difficulty in producing the strings, and their resultant beauty, is what gave wampum intrinsic value. Throughout much of the 17th and 18th centuries, exchange rates for white wampum were set: 360 beads = 5 shillings; 6 beads = 1 penny. Purple wampum, less abundant in nature, was worth at least twice as much as the white. Some of the things you could use wampum for as legal tender included taxes due to the Commonwealth of Massachusetts, tuition at Harvard University, and passage on the Brooklyn Ferry. As the 19th century progressed, wampum became less important for barter, but it wasn't until around 1890 that the last wampum mill shut down. To be honest, Doty's approach to the subject is quite dry, and is best suited to the scholarly type. That being said, he does a great job placing the story of America's money in historical and cultural context. Our monetary system evolved as our experience as a nation grew; money changed and stabilized as we developed from a struggling nation into the world's lone superpower. In 2008, Doty published a new version of America's Money - America's Story . If it's anything like the original in terms of content, then it just has to be one of the best friends a numismatic researcher could ever hope to have. One of these days, when we get back to adding chapters to the "Coins & US History" section, Doty's new book gets the "Buy Now" click at Amazon from us. 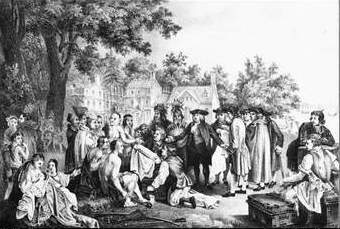 The Virginia House of Burgesses met for the first time in 1619, The body consisted of elected Jamestown representatives to make laws for the colony. In the engraving above, Patrick Henry stuns the assembly by asserting the colonies' right to independence, in defiance of Stamp Act of 1765. Image courtesy of National Archives. Many of the first European transplants to the English colonies retained their Old World customs of class society and restrictions on religion, education, voting rights, and individual freedom. Being far moved from the English throne by the Atlantic Ocean, the colonists couldn't depend upon regular guidance from London, and so out of necessity, formed self-governing bodies to deal with their daily business affairs. Unlike power concentration in the hands of a few as was typical in Europe, control in the colonies was shared by many more people. Slowly, the colonists began to question the restrictive practices of their European forefathers and developed a wider tolerance for religious freedom and representative government. As many decades passed, American colonists set their own principles, quite distinct from those of the Mother Country. The growing French presence in "The Ohio Country" and Canada led to a war between Great Britain and France beginning in 1754. At stake was the dominance of northeastern North America. By 1763 the British had soundly defeated their longtime rival, adding a huge chunk of territory to an already rapidly expanding empire. Perhaps to the average Englishman, the sight of wealthy merchant ships crowding into British harbors was a good sign, but many troublesome problems were emerging. In defeating enemies and extending its reach to all known points on the globe, Great Britain had accrued an enormous national debt. 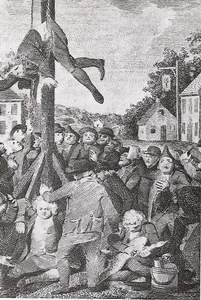 The Stamp Act ignited an angry response from the colonists, Above, a tax collector is tied to a pole by an unruly crowd. A British loyalist is secured at bottom of pole. Image courtesy of Library of Congress. The British government looked to the American colonists to start shouldering a heavier burden of the empire's finances, in the form of higher taxes. After all, British leaders reasoned, the colonies were prosperous, benefiting from the sale of materiel to the British army and navy, all the while enjoying the protection afforded by the same. The Sugar Act of 1764 and the Stamp Act of 1765 were some of the more infamous attempts by the British to extract additional revenue from the Americans, and were rigorously enforced. Other laws, including the Proclamation of 1763 and the Quartering Act of 1765, were enacted to establish greater administrative control in the colonies. These "reforms" were met with strong opposition from the colonists, who seethed in resentment over the fact that all these new demands were being imposed by a Parliament in which they were not represented. Relenting to pressure, the Stamp Act was eventually repealed, but tensions increased yet again with the passage of the Townshend Acts in 1767, which assessed import duties on articles entering American harbors. "Writs of Assistance" were codified by Parliament, authorizing British government officials to search for smuggled goods anywhere and at anytime. Colonists protested their rights as Englishmen were violated by the hated Writs. The Boston Massacre, March 5, 1770. Crispus Attucks (center), a runaway slave, is believed to be the first man killed in the American quest for independence from Great Britain. Five civilians were shot dead in the fracas, which greatly escalated anti-British sentiment throughout the colonies. Image courtesy of National Archives. In early March, 1770, an angry demonstration against British troops quartered in Boston got out of hand. As the mob grew more fierce, the Redcoats fired into the crowd, killing three and mortally wounding two others. As news of the "Boston Massacre" spread, the people of city were filled with rage. Some months later, the soldiers involved in the incident were put on trial for murder. In one of history's strangest ironies, the legal defense team for the British included John Adams, who later became the second President of the United States. It was Adams' belief that everyone deserved a fair trial, even unpopular defendants. When the verdict was read, all but two of the soldiers were acquitted, and these two ended up serving minimal time on manslaughter convictions. Following the Boston Massacre, earnest attempts were made to reconcile differences between the American colonists and the British government. For a few years, at least, bad feelings indeed subsided. However, when Parliament enacted the Tea Act of 1773, a measure designed to promote the interests of the privately owned British East India Company and in effect monopolize the tea trade, the final chain reaction of events were set in motion that would eventually result in an armed rebellion against the British Crown. The deliberate destruction of property and violation of British law at the Boston Tea Party forced Britain to act against the resistance, or risk loosing control of the American colonies. Image courtesy of National Archives. The colonists viewed the Tea Act as a slap against American-based enterprise. What industry would be the next to be monopolized? On the evening of December 16, 1773, a group of colonists led by Samuel Adams, dressed themselves as Native Americans and boarded three British East India Ships in Boston Harbor. In what history has dubbed the "Boston Tea Party", the men destroyed 342 chests of tea (about 15,000 pounds) by tossing it overboard, to dramatically protest the Tea Act of 1773. If one of the objectives of the Boston Tea Party was to rile the Mother Country, then that phase of the operation was a total success. When word of the incident reached London, British officials responded furiously by passing four measures in 1774 to broaden government control in America. The colonists defied the new demands by calling them "The Intolerable Acts". Delegates to the First Continental Congress file out of a session. Perhaps the word "revolution" could be overheard by bystanders. Image courtesy of Library of Congress. On September 5, 1774, delegates from all but one of the thirteen colonies (Georgia did not participate) met in Philadelphia for the purpose of deciding what could be done to appropriately respond to what they perceived as increasing hostility heaped against them by the British government. The meeting, known as the First Continental Congress, ended seven weeks later with the adoption of resolutions demanding the restoration of British policies that existed prior to 1763. The colonists reasserted their liberties as free Englishmen, but went further and claimed the right to maintain self-governing legislative bodies. Finally, the delegates declared their mutual support of one another, and agreed to meet again in the spring of 1775 if London had not addressed their list of grievances. As the meeting adjourned, many of the delegates expressed their belief that a violent revolution was inevitable. Much less certain, however, was the outcome of any such rebellion. The "NE" coins (replicated shilling shown above), released in 1652, were the first coins ever minted in the New World, outside of Mexico. Images courtesy of EarlyAmerican.com. From the inception of the first American settlements onward, Great Britain failed to seriously consider the coinage problems mounting in her colonies across the Atlantic. Since the British Parliament evidently was not going to provide more coins for the hard-pressed colonists, some of the more industrious Americans opted to take the matter into their own hands. By law, the British Crown possessed sole authority over coinage. Without seeking permission, the General Court of the Massachusetts Bay Colony contracted John Hull to begin minting coins. Hull set up a mint in Boston and began producing the well-known "NE" [New England] coins in 1652, the denominations being three pence, six pence, and one shilling. 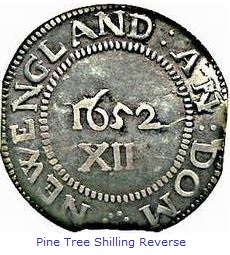 The design simplicity on the NE coins was an easy target for counterfeiters, leading to the better known "Pine Tree" coinage, minted from 1667-1682, though all bore the date 1652. 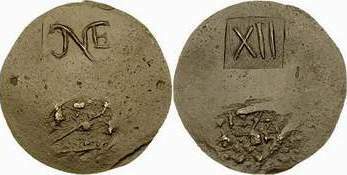 This was to deceive the British, who had raised objections about the "NE" coins of 1652, into believing that colonial coins were discontinued beyond that year. Willow and Oak tree coins also were struck. As the 17th century gave way to the 18th century, other coins and tokens of various types were introduced and used by the colonists regularly, to circulate alongside coinage originating in other nations, in what was clearly a coin-starved America. In the midst of the rapid fire round of new taxation in the 1760's, Parliament also invoked the Currency Act of 1764, agitating the colonists to a higher degree still. The regulation prohibited colonies from printing paper money. Worse yet, all taxes were to be paid to the King in gold or silver coins. With coinage already scarce, the Currency Act made it even more difficult for American merchants to find money for conducting their daily business transactions. The escalating tempers resulting from the Currency Act provided yet another wedge to widen the gap between Great Britain and her colonies. 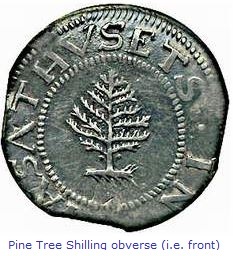 The production of pine tree shillings (obverse shown) was a defiant act against British law prohibiting private colonial coinage. The pine tree persisted as a symbol of independence and 100 years later appeared on battle flags during the Revolutionary War. 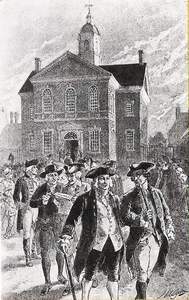 Image courtesy of EarlyAmerican.com. We have attempted here to lay out a few of the basics on American colonial coinage, but if you're really interested in knowing more, we believe there is simply no better reference than Walter Breen's Complete Encyclopedia of U.S. and Colonial Coins. The text and marvelous illustrations explain the history of all American coins, from the colonial era to modern times. Yes, it's expensive, but well worth it. It's one of THE ultimate books of American coinage, a resource used everyday by serious numismatists. And so, for many, many years, currency in the American colonies remained an odd mixture of wampum, beaver pelts, foreign coins, "forbidden" private coinage, paper money, and tokens. The coinage issue apparently was destined to remain static, unless some monumental event intervened to alter the course of history. As the 1770's continued to unfold, such an event did occur, that gave rise to a new nation... The American Revolution. 2 Breen, Walter. Complete Encyclopedia of U.S. and Colonial Coins. New York, NY: Doubleday Publishing, 1987. 3 Brinkley, Douglas. History of the United States. 4 Doty, Richard. America's Money, America's Story.